As more and more organizations embrace Business Process Management (BPM) for the design of enterprise organizational and information systems, the demand for BPM training increases. Many companies claim they’re the best at BPM training. Who should you believe? Believe what industry expert Forrester Research is saying in the 2012 Forrester Wave report BPM Training and Certification Programs. 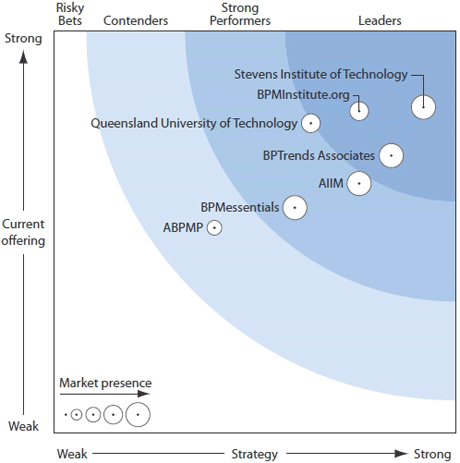 It evaluates top BPM training and certification providers, citing BPMInstitute.org as a leader in the BPM training market - and a top scorer in 7 of the 15 BPM skills development categories. 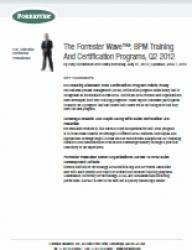 Download your copy of the Forrester Wave report BPM Training and Certification Programs and get their objective review of the top organizations in the BPM training space. EDITOR'S NOTE: This report was available for free for a limited time and is no longer available for download. To purchase and download the report, visit Forrester’s website. If you are interested in BPMInstitute.org’s Training and Certification, contact us for a free consultation.